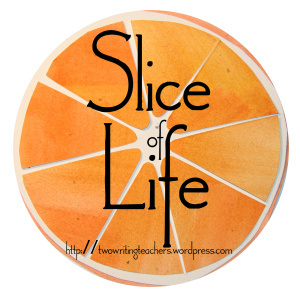 A huge thank you to all the contributors for Two Writing Teachers for continually supporting a community of writers, by encouraging us to share a slice of our lives each and every Tuesday throughout the year (and pretty soon, each day of March)!! Community -- I think this is a word I will exploring for quite some time. I feel like it is going to become one of my new "writing territories." This past weekend, I was blessed to be part of a community of learners at the Dublin Literacy Conference. All the energy and learning that took place that day was phenomenal (but that is a post for another day)!! 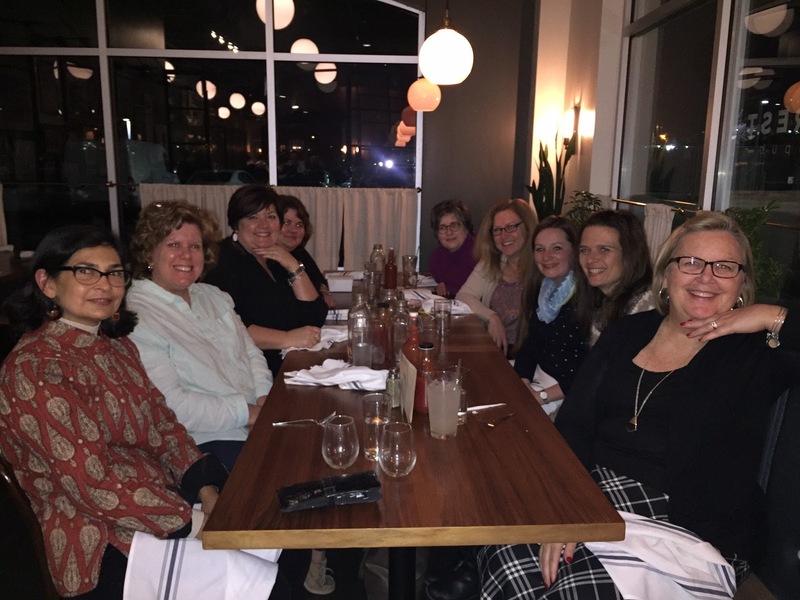 One of the many highlights of the #DubLit16 was gathering with friends for book browsing and dinner after the conference. Both Central Ohio friends, as well as friends who had traveled from Maine, New Jersey, and Tennessee gathered at a wonderful local restaurant for great food and stimulating conversation. We were seated at a long table, and I found myself sitting across from Tara Smith and Julie Johnson. Our conversation was lively, hitting on many topics. But at one point, the conversation came around to Slice of Life, and with that conversation came a big "Aha!" moment for me. As Julie and Tara talked, it became vividly apparent that the two of them knew other slicers quite well. Over many weeks and years of reading their slices, these ladies were invested in others' life stories and their well-being. This was the piece I was missing. I would contribute to Slice of Life Tuesdays on a very irregular basis, and then found it easy to drop when life got in the way. But... if I became a more active participant in this community - not just sharing my post, but reading and responding to others - I might realize as Julie and Tara already have, that this community is one in which I want to fully participate and be a good citizen. So, beginning today, I will begin posting Slices again. And, I will be reading others' slices and leaving comments for them. As the March Slice of Life Challenge approaches, my challenge to myself is not to post each and every day, but to do so more often, and not just wait for people to come to me and leave comments, but to reach out to others as well. Community will take on a new meaning for me. Karen -- I was so happy to see your post this morning! I love this community - it has supported me in so many ways. It is interesting how connections seem to be made when we least expect them and need them the most. Looking forward to connecting with you in this community. Welcome back! What you say is so true. There are many I have never met (Tara for example), but yet I regard them as close friends because of the words written and read. There is a hole in my week when I am not able to read or write and be a part of this group. That's been going on for over five years now. "What you get from a community is only as rich as what you contribute." This is true in any part of life. Drop by when you can, Karen. We're always delighted to have you join us! Reaching out to community is such a supportive gesture, Karen. I find now, the more I write within my communities, the more friendships develop. Blogging becomes a tool of good will while broadening my scope. The more I listen to others the more inspired I become. I am so glad that you are back on the circuit with us. Hooray! I so loved spending time with you, Karen - and look forward t those slices. I recognize Cathy in the picture! Wish I still lived in Central Ohio. I agree, I have taken part in the Tuesday Slice, but after some things got in the way, I became just a sporadic participant. I hope that the March Challenge will get me back in the community. It is a good one. Yep! We had such a great time learning, laughing, and catching up. Jackie, we miss you in Central Ohio. This is such an important discovery and reminder for all of us I am happy I heard the same conversation at dinner and heard your thinking at writing group tonight. Community brings connections, connections fill our buckets and probably warms our soul. I'm so excited you're writing again. Seems like we both came to the same conclusion at dinner the other night. I to am so thankful for this community of readers writers and thinkers. Thank you for this reminder that giving to the community is part of our responsibility as digital citizens. Lately, I've been a bit guilty of reading blog from my phone, and not taking the time to comment (as commenting from my phone is a nightmare). Thank you for reminding me of my obligation in this community. This will also be an important conversation for me to have with students as we begin our Slice of Life Challenge on Tuesday.